AFS directly funds research projects from allocation of a portion of the annual dues paid by AFS Corporate Membership. In addition, AFS is involved in several research partnerships funded through government funding and industry contributions and other means. Support of research is critical for North America to maintain a strong, vibrant, healthy and continually advancing metalcasting industry. AFS participates in these projects by securing industry partners and providing technical management and oversight. AFS is currently active in two metalcasting research funding partnerships. AFS is a partner in the American Metalcasting Consortium (AMC.) AMC is funded through the US Department of Defense (DOD) and Defense Logistics Agency (DLA). The American Metalcasting Consortium provides direct support to the DLA through new technology, improved processes and technical expertise in the procurement of metalcasting to ensure warfighter readiness. AFS is managing two projects under the current AMC program, entitled Innovative Casting Technology. AFS through AMC/DLA has developed a very effective web-based tool called Casting Alloy Data Search (CADS) for the design engineers and ICME professionals, which has been used for over 5 years by the foundry industry and accessible through their website. CADS needs to further expand to accommodate more ICME relevant data generation for optimization and more accurate predictions, such as thermo-physical and thermo-mechanical properties required for process simulation, beyond casting alloys, for example molding materials. The goal of this research project is to enhance the current CADS and create an additional module of CADS for the non-metallics, such as molding and core materials being used in the sand casting process and populate by generating and validating data useful to the ICME professionals. CADS is developed in partnership with Product Development & Analysis (PDA). The project will develop an effective and integrated ICME framework as an approach to make more efficient casting designs and improved manufacturing approaches. Current physics-based simulation tools are limited to simulate for a few, finite known process variabilities, but do not account for many more process variables, including dimensional, compositional and section thickness variability inherent to the metal casting process. A comprehensive approach of physics-based simulation with probabilistic meta-modeling using historic data is unique and will allow for rapid and more accurate predictions. The Advanced Casting Research Center (ACRC) is a collaboration of companies to fund and promote research addressing the global foundry industry. ACRC brings fundamental understanding to existing processes, develops new methods and addresses management–technology interface issues with industrial partners. ACRC helps the industry resolve technical issues by bringing members, WPI faculty and staff together to discuss and brainstorm solutions. About the ACRC: The ACRC, founded in 1985, is an academic–industry partnership headquartered on the campus of Worcester Polytechnic Institute in Worcester, Mass. Built on the university’s strengths and focused on helping industry solve technical issues, the center provides a collaborative environment, in which members, faculty and students discuss challenges in the metal casting industry, specifically in the areas of light metals, non-ferrous alloys and semi-solid processing. This is an exploratory project to investigate the Al-based HEAs. The aim is to develop a new set of alloys with either high stiffness, both good ductility and strength, or excellent creep resistance at high temperatures (> 300 °C). Modern foundries have the capability to capture a vast amount of process data on a daily basis. However, the data from various sources throughout the operation are often kept in silos where their value might have limited utility. This is especially true when there are no significant quality issues arising to motivate a holistic interrogation of these data. It is a lost opportunity for the foundry if there is no way to compile, fuse and analyze these data to better understand the process factors influencing the quality of castings. The scope of this project is to develop a ferrous insert that promotes the growth of a strong metallurgical bond with the aluminum during the casting process. The goal of this study is to measure and predict residual stresses in aluminum cast parts. It is important to understand the factors that affect the stresses in aluminum casting and to develop data that can be used in simulation technologies. The adoption of the ICME approach will greatly speed up the evaluation of new alloy chemistries. A new Magnesium LPSO Cerium Alloy with high yield strength/elongation and wide operation temperature range will be developed. This is a fundamental project to establish the root cause of the problem and to recommend a green and clean method to process Cu-containing Al alloys during molten stage. 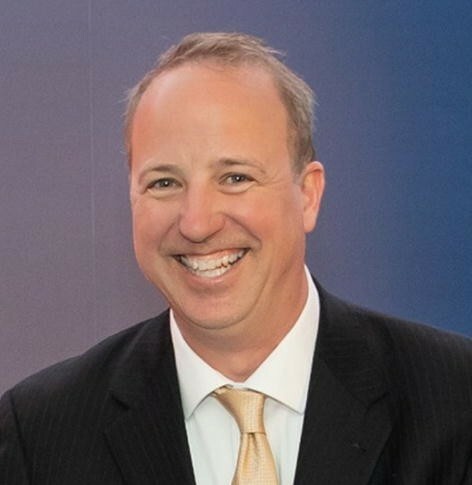 Randy Beals, global engineering specialist for ACRC member Magna International, has been appointed chair of the board. The position recognizes Beals’ expertise in aluminum and magnesium processing and product development, along with Magna’s long-term relationship with ACRC. Beals’ appointment begins in January 2019 and runs for 2 years. Previously, Kevin Anderson of Mercury Marine served as chair of the Board from 2013 to 2018 and David Weiss of Eck Industries before him. Weiss has served as director-at-large for the organization since 2013 after John Jorstad retired. ACRC members include: Aluminum Rheinfelden GmbH, Aluminum Association, American Foundry Society, ATEK Metal Technologies, Can-Eng Furnaces International, Consolidated Metco, Eck Industries, Fiat Chrysler Automotive, Foseco, General Aluminum, General Motors, Harley-Davidson, Hazelett, H.C. Starck, Kunshan Liufeng Machinery Industry, MAGMA Foundry Technologies, Magna International, Montupet S.A., Mercury Marine, NADCA, NEMAK, Nikkei MC Aluminum, Oshkosh Corporation, Palmer Foundry, Pratt & Whitney, QuesTek Innovations, Rio Tinto Aluminum, Sakthi Automotive, Shiloh, Terves, Tesla/SpaceX and VJ Technologies. AFS directly funds research projects from allocation of a portion of the annual dues paid by AFS Corporate Membership. The current AFS-funded research projects are described below. Currently, lost foam tooling is, in general, prohibitively expensive with long lead times associated with complexity of the tool designs, and typically restricted to high-volume production. Significant market is available if the cost of tools and the lead time is brought in-line with conventional casting processes. In order to expand the marketability and viability of the lost foam casting process, this project will demonstrate production of tools for high-mix low-volume to high-production-level tools using 3D-printed aluminum. The project will take into account material durability, material costs, cycle time, equipment costs and skill level required for production as compared to conventional methods. Aluminum will be tested to find acceptable parameters for cost, delivery and performance. This will provide insight into the utilization of printed aluminum as a tool material. The work is being monitored by the AFS Lost Foam Division and the Additive Manufacturing Division. Those interested in more information about the project or how to participate should contact AFS Technical Research Assistant Ryan Davis (rdavis@afsinc.org). This project goal is to produce low-carbon (.08% C maximum) stainless steel in the lost foam process. This steel-casting market is primarily ruled by the sand and investment casting processes. Sand, while reasonably fast for delivery, especially in 3D-printed core and tool applications, is relatively imprecise compared to lost foam and investment requiring extensive machining of the casting and requires more weight for draft, stock and molding dimensional issues. Investment, while precise, has size and cost limitations. While there have been examples of success producing ASTM A351 CF8 M grade of stainless steel (.08% C maximum), a sponsored study to develop the necessary parameters for producing stainless steels in the lost foam process has not been performed so that the process can be refined and deployed. Defining the base chemistry metal parameters to accommodate carbon pick up, pattern bead type and density are not tested and defined aside from tolerable pattern density levels. Coating type and permeability are not yet established nor molding media parameters although they are basically understood. This project will produce ASTM A351 CF8 M Stainless Steel with .08% maximum carbon level in the lost foam process by understanding and implementing practices of bead selection, bead expansion, expanded bead density, permeability and fusion, coatings and their permeability, carbon consuming additives, metal pouring rates and base composition and molding media refractoriness and permeability. The work is being monitored by AFS Lost Foam Division. Those interested in more information about the project or how to participate should contact AFS Technical Research Assistant Ryan Davis (rdavis@afsinc.org). Current practices to weld 206 alloy castings, particularly for repair of through wall defects or defect depths of greater than 0.25”, result in unsatisfactory welds. Both 206 and 2319 weld rod are typically used for repair welding of 206 castings. A recent project to determine the effect of weld repair on the static & dynamic properties of A206 sand castings did not successfully produce welds of the desired quality. The work determined that the major problem is the chemistry of the weld wire used to make the welds. The two alloys currently used by AFS foundries (A206 and 2319) either produce inconsistent weld quality (A206) or low ultimate tensile strength (2319). Develop improved repair welding practices. Establish effect of welding parameters on weld quality. The work is being monitored by AFS Aluminum Division. Those interested in more information about the project or how to participate should contact AFS Technical Research Assistant Ryan Davis (rdavis@afsinc.org). Cast iron with spherical graphite (SGI) has a unique combination of high strength with good melt fluidity allowing the metal casting industry to produce complicated geometry castings. There are many successful examples when integrated SGI castings have been substituted for steel stampings or forgings. SGI has less solidification shrinkage than steel; however, it is significantly higher than in gray iron. 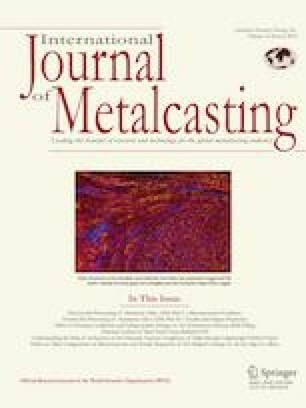 Currently, foundries use effective techniques to prevent formation of macro-shrinkage defects in hot spots; however, increasing complexity of ductile iron castings makes it difficult to produce sound castings without more widely distributed micro-porosity. Intensive risering helps with the elimination of large shrinkage pores but does not always guarantee the absence of micro-porosity. Elimination of micro-porosity will improve casting integrity and increase such important whole casting properties such as fatigue life and low-temperature toughness. The objective of this project is to study metallurgical factors affecting micro-porosity formation in SGI castings using novel experimental and simulation methods. The research will experimentally determine the mutual effects of SGI liquid metal processing on micro-porosity,—link solidification kinetics to micro-porosity, suggest methods for controlling micro-porosity in SGI castings and improve SGI casting soundness. The work is being monitored by AFS Cast Iron Division. Those interested in more information about the project or how to participate should contact AFS Technical Research Assistant Ryan Davis (rdavis@afsinc.org). Recent understanding on the effect of filling conditions on casting surface and performance of aluminum castings has resulted in design of new gating systems that eliminate damaged metal, greatly increasing casting quality and yield. It has been proposed by recent researchers that nearly all surface and internal defects in steel castings result from air entrainment during turbulent filling conditions causing unnecessary weld repair, low mechanical properties and customer rejections. Novel gating systems have been boasted by some to greatly reduce oxide and gas defects and completely eliminate the need for post-welding of steel castings. However, there has never been a quantitative study to determine the effectiveness of these gating systems for steel castings and the impact of filling conditions on actual steel quality is currently unknown. The purpose of the research is to quantitatively evaluate the effect of different filling conditions on steel-casting quality and mechanical properties. A series of test castings will be produced utilizing different rigging systems commonly used in steel foundries. Filling of gating systems such as direct pour, horizontally gated and bottom gated systems will be designed using filling and solidification software. The results of casting trials will be compared to the use of best-practices design involving bottom fill utilizing vortex gating. The objective will be to quantitatively compare casting metal quality and filling simulation results for a variety of filling conditions utilizing a combination of optical metallography, automated nonmetallic inclusion analysis and evaluation of mechanical properties. This project is being monitored by the AFS Steel Division. Those wishing more information about the project or how to participate should contact AFS Technical Research Assistant Ryan Davis (rdavis@afsinc.org). Permanent molds are subjected to high thermal stresses and are prone to distortion. Each casting cycle introduces heat into local areas of the mold, increasing the temperature and creating severe thermal gradients. Most of the mold material stays in the elastic deformation region and returns to the original dimensions upon cooling. However, in some parts of the mold the compressive surface stresses may exceed yield, resulting in permanent, plastic deformation. Other metallurgical events are also a factor as the mold distortion develops over many casting cycles where time at temperature is an issue. This is primarily a computational effort supported by experimental data. In this study, finite element modeling will be used to identify the sources of mold distortion and also to explore methods to minimize mold distortion. Computer software will be used to assess both thermal stress and the change in microstructure that will occur due to time and temperature for the hot face of the mold cavity. A permanent mold will be obtained from participating companies along with the CAD used to fabricate it. The geometry of the used mold will be captured with a laser scanner (CWRU). Computer simulations of stress and distortion will be conducted by Dante Solutions to identify sources of mold distortion, and predictions for the specific mold will be compared to the laser scanned model. This project is being monitored by the AFS Permanent Mold Practices Committee. Those wishing more information about the project or how to participate should contact AFS Technical Research Assistant Ryan Davis (rdavis@afsinc.org). OSHA’s new worker exposure standard for respirable, crystalline silica requires that foundries limit exposure during work shifts to about one-half the concentration level of the previous Permissible Exposure Limit (PEL). Meeting this strict standard will necessitate that foundries refine their ability to identify and address root causes of exposure. Unfortunately, the method of averaging silica exposure over the work shift does not provide a basis for pinpointing those activities that have the greatest impact on overall average exposure levels. Real-time monitoring of silica concentrations could provide the needed diagnostic capability. However, this method is only in the developmental stage at this time. Instruments are commercially available to measure the concentration of silica-bearing respirable particulate matter (RPM). If real-time RPM measurements can be correlated to its silica content in a foundry situation, the needed capability for diagnosing the root causes of exposure could be made available to foundries. The goal of the project emanating from this proposal is to develop a procedure for providing the needed correlation in a wide variety of foundry process operations. The work is being monitored by AFS Environmental Health and Safety Division. For more information, contact the PI Robert Scholz at rscholz@trcsolutions.com or AFS Technical Research Assistant Ryan Davis (rdavis@afsinc.org). Today, predicting the actual filling damage that oxides may cause to a casting remains largely based on theory, experience and speculation. In the past decade, great strides have been made in simulation capabilities. Heat transfer data and computational fluid flow have been combined to do a wonderful job of predicting porosity and mechanical properties. Filling concerns such as excessive filling velocity, eddies and other turbulent conditions can also be noted with simulation software. However, simulation software does not take the chemical reaction of oxide formation into account. Filling results only offer an indirect indication of the potential oxide damage, with no effect to the predicted porosity or mechanical results. As such, serious pitfalls can exist when it comes to interpreting simulation results. Without correlating filling concerns related to oxide damage, misleading simulation results can be predicted. If a gating design includes well-placed feeders and chills, but includes turbulent filling conditions, simulation can falsely predict excellent soundness and mechanical properties despite the filling damage noted indirectly by viewing the filling results. As foundries look for competitive ways to tool and fill castings, this confusion can tempt a foundry to choose a more turbulent-fill gating design if the simulation results predict quality advantages over a more tranquil-fill gating design. This project is intended to help answer these difficult questions with meaningful data that can be used to quantify these concerns. The project is being monitored by AFS Aluminum & Light Metals Division. Those wishing more information about the project can contact the PI Dan Hoefert at Dan.Hoefert@eckindustries.com or AFS Technical Research Assistant Ryan Davis (rdavis@afsinc.org). The lower cost of silica sand and its relatively high refractoriness make it a viable and economical choice for green sand systems, with millions of tons of silica sand used every year. However, a new rule by Occupational Safety and Health Administration (OSHA) considerably toughens the use of silica sand in a foundry. The regulation will require foundries to implement extensive engineering controls, which will be cost prohibitive for small-to-medium-sized metalcasting facilities. One possible solution for foundries will be to utilize a non-silica aggregate in their green sand systems. This will minimize or eliminate the respirable crystalline silica, in addition to the large capital cost associated with engineering controls mandated in the new regulations. Little research has been conducted in the use of alternate non-silica aggregates in a green sand system, and these materials need to be characterized and tested for ensuring good results when bonded with a bentonite clay. It is the intent of the project to determine what limitations non-silica aggregates have in the replacement of silica sand and then to educate the industry in these areas. The work is being monitored by AFS Technical Department. Anyone interested in more information about the project should contact the PI Jerry Thiel at thiel@uni.edu or AFS Technical Research Assistant Ryan Davis (rdavis@afsinc.org). The final report for this project is now being finalized. The new Occupational Safety and Health Administration (OSHA) regulations limiting exposure to respirable crystalline silica has renewed interest in alternatives to silica sand which can withstand the heat of metalcasting and the rigors of repetitive reuse. Foundries have used alternative materials for decades. Chromite, zircon, olivine and carbon sands have each been successfully used to solve operating problems and thus have developed their specific niches in the foundry materials inventory. However, there are several other materials that are candidates for replacing silica sand, such as fused alumina, sintered bauxite and ceramic sands. Compositions and shapes could be readily tailored for a metal casting process with overall recycling (reclamation) affording sustainable materials management. This study examines materials that are readily available as alternatives to silica sand from a functionality perspective and evaluate their effectiveness for green sand casting. Status Update: The work is being monitored by AFS Technical Department. Anyone interested in more information can contact the PI Dr. Sam Ramrattan at sam.ramrattan@wmich.edu or AFS Technical Research Assistant Ryan Davis (rdavis@afsinc.org). The research is completed, and final reports are being finalized and will be ready for publication soon. The American Foundry Society website provides tools to assist casting design engineers in selecting the best casting process for a potential component, and also provides casting alloy property data on many commonly used alloys. The goal is to give casting users, design engineers and purchasers relevant and accurate information on casting capabilities and properties, providing easily accessible and retrievable information from a single site. The alloy property data can be quickly exported to a spreadsheet or FEA tools. The casting alloy & process selector, Casting Alloy Data Search (CADS), is located on the AFS website, www.afsinc.org under the tabs: Designers & Buyers tab or can be accessed directly at: http://www.metalcastingvirtuallibrary.com/cads/cads.aspx. For more information, contact Steve Robison, AFS Chief Technical Services Officer, at 847-824-0181 ext. 227, or srobison@afsinc.org. The Casting Source Directory is also available to the public on the AFS website. The site provides a directory of North American metal casters in a single source. Potential casting buyers can search by metal, alloy, casting process, casting size (weight) and US state to locate a casting provider that meets their needs. The Casting Source Directory is located on the AFS website under the Designers & Buyers tab or can be accessed directly at https://www.afsinc.org/metalcaster-directory. For more information, contact Steve Robison, AFS Chief Technical Services Officer, at 847-824-0181 ext. 227, or srobison@afsinc.org. CastingConnection is a private, professional social network to connect, engage and share critical industry information and best practices in real time. Through the Open Forum and sites devoted to our special interest groups, members gather to network via a comprehensive member directory, and participate in focused discussion groups. AFS members access and share useful, informative documents and media in all formats. Visit https://castingconnection.afsinc.org. 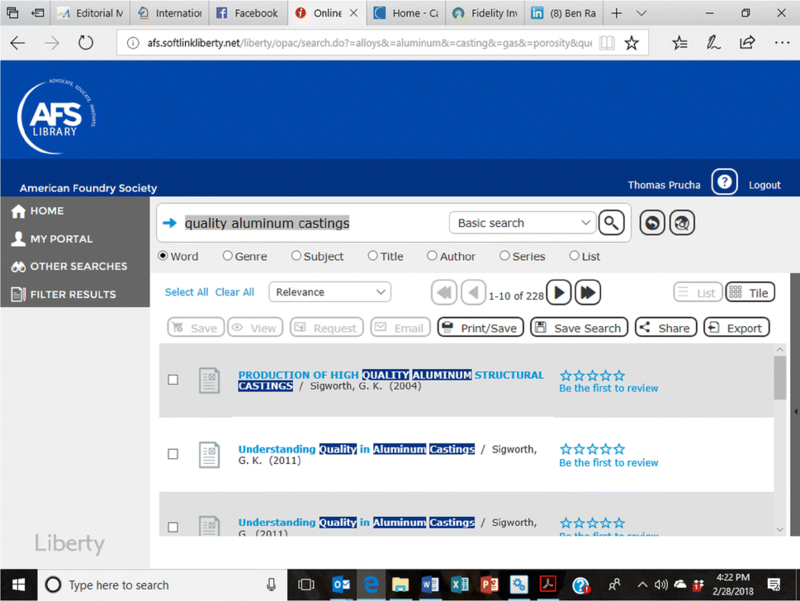 The new AFS online library serves the needs of the metalcasting industry for current and historic information on metallurgy, casting processes and material property data. The digital library is open to all AFS members. With a simple-to-use search, members have access to relevant technical and research articles and reports from all AFS published sources. Author and summary information are available for viewing, and full articles can be downloaded. All technical and management papers published in AFS Transactions, from the very first edition (published in 1896) to the present, are available, as well as technical articles from all AFS magazines. Hundreds of members have already leveraged this resource, conducting thousands of searches that span topics ranging from iron inoculation to silica exposure to gating and risering design. The library is located on the AFS website (www.afsinc.org) under the “Innovation & Management” tab. 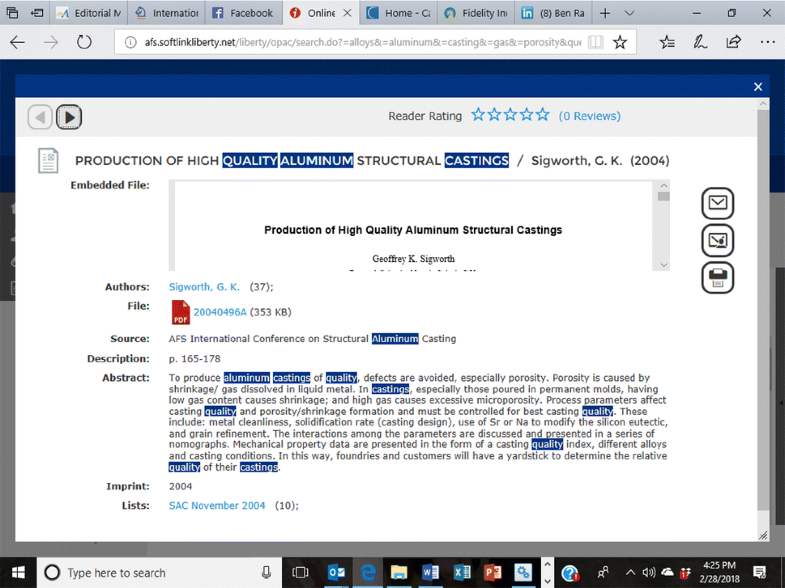 The library also includes summary information for technical articles published in the International Journal of Metalcasting. For more information, contact the AFS Technical Research Assistant Ryan Davis at 847-824-0181 ext. 219, or rdavis@afsinc.org. AFS has launched a new program that offers industry-specific training, information and education for metal casters in a web-based format for a single access fee. The e-Learning program gives subscribing organizations full access to online modules for formal staff training on a wide variety of metalcasting topics. Individual e-Learning modules also are available a la carte. More information and a video demonstration are available at www.afsinc.org/e-learning. Representatives of the entire metalcasting industry supply chain will be at CastExpo 2019 on April 27–30, 2019, in Atlanta, GA, USA. CastExpo 2019 is the largest North American gathering of the metalcasting supply chain, including full-scale exhibits, cutting-edge technology demos and new equipment and materials. Innovative education sessions will include keynote presentations, technical and management presentations, and a new education track targeted for casting designers and purchasers. The education sessions will provide casting personnel with opportunities for personal and professional development through 3 days of practical advice, the latest technology advancements, new process and material developments, and foundry case studies. Education sessions will cover all common cast metals and processes, as well as information relevant to business, management and special interest groups. The AFS Hub will feature areas for connecting with AFS staff and other attendees, the AFS Bookstore, The AFS Institute, AFS Member Services, Casting Designers & Buyers education track presentations and Foundry-in-a-Box Demonstrations. For more information on CastExpo education sessions, contact Metalcasting Congress coordinator Pam Lassila at 847-824-0181 x240, or plassila@afsinc.org. AFS offers members and industry personnel an extensive program of professional development and learning opportunities in 2019 on a wide variety of topics covering all aspects of metalcasting including casting alloys and technologies, as well as events targeting EHS, management and marketing professionals. In addition to education events targeting management, marketing, government affairs, human resources and foundry leadership, AFS is sponsoring several workshops and conferences focused on best practices and the latest metalcasting technical developments, metallurgy, production and safety. Advanced Foundry Waste and Byproducts Seminar (February 19–20, 2019): Management of foundry process solid wastes and industrial byproducts can be one of the most significant environmental costs facing metal casters today. In addition to the high cost of management, metal casters face significant regulatory and environmental liability if these materials are improperly characterized and/or mismanaged. Seminar attendees learned how to properly identify and characterize their foundry process solid wastes (hazardous and nonhazardous) and byproducts, and how these materials are regulated. The seminar included hands-on class exercises where participants worked through real-world foundry waste and byproduct management issues. Future Directions in Steel Casting (July 10, 2019): A 1-day class focused on the future of steel castings. The American Foundry Society has assembled senior steel foundry executives and steel-casting academic leaders from around the country to provide a look into the future of steel castings. This interactive seminar will cover new innovations, ground-breaking research and feature an economic forecast for steel castings. For more information, contact AFS Technical assistant Kim Perna (kperna@afsinc.org). To register, call AFS customer service (847-824-0181) or www.afsinc.com/2019fdsc. Copper Alloy Workshop (September 18–19, 2019): The AFS workshop on Casting Copper Alloys will provide details on commonly poured alloys and metallurgy, with emphasis on best practices for melt cleanliness, pouring and casting process control. Presentations include information on melting and pouring non-leaded alloys, new alloy developments and the latest research and developments relevant to copper alloy casting. The seminar is geared toward foundry management, supervision and operators to further their knowledge on copper-based alloy casting processes and help with finding solutions for the foundry. 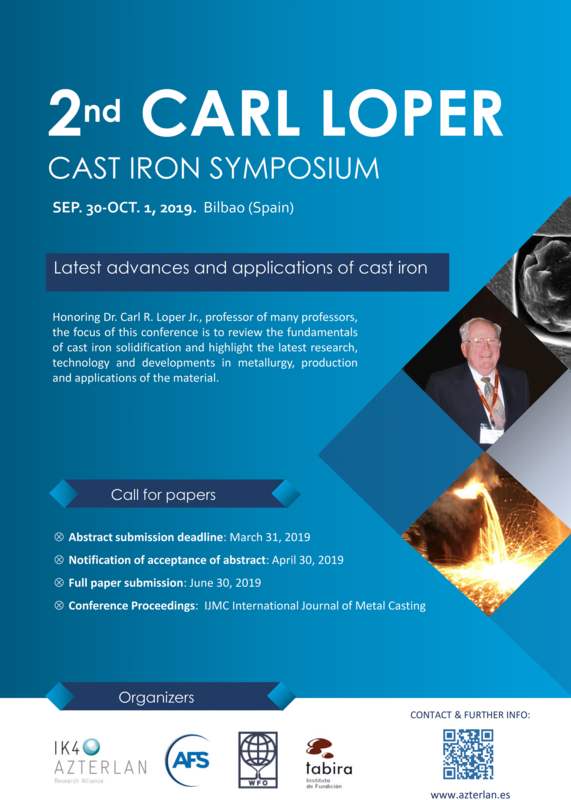 2nd Carl Loper Cast Iron Symposium (September 30–October 1, 2019): This symposium is co-sponsored by AFS, honoring the late Dr. Carl R. Loper Jr., with the focus to review the fundamentals of cast iron solidification and highlight the latest research, technology and developments in metallurgy, production and applications of the material. Taking advantage of the 10th anniversary of the 1st Carl Loper Symposium held at Madison, Wisconsin (USA), the 2nd Carl Loper Symposium is being held in Bilbao (Spain) and organized by IK4-Azterlan Metallurgy Research Centre, SPAIN, and includes Key Note invited and contributed papers from leading academic and industrial community. Web-based Events: AFS also offers a series of technical webinars. Open to all industry personnel (offered at no-cost to AFS members), the web-based seminars provide relevant information presented by industry experts on a wide variety of metalcasting subjects. An archive of past webinars is also available. For a full listing of upcoming and past webinars, visit the ‘events’ tab on the AFS website at: https://www.afsinc.org/. AFS educational events provide relevant and practical information to improve casting quality, productivity and profitability for metalcasting facilities and provide expertise in marketing and management issues. For more information, contact the AFS Technical Assistant, Kim Perna, 847/824-0181 x 246, technicalassistant@afsinc.org, or Chief Technical Services Officer, Steve Robison at 800-537-4237 x227, stever@afsinc.org. For a full listing of AFS educational opportunities, visit the ‘events’ tab on the AFS website at; https://www.afsinc.org/. International Ferrous Melting Conference, Nashville, TN.